The TATRA PHOENIX rage of heavy trucks experienced a number of major events in just the past year. One of them was achieving the milestone of one thousand units produced. 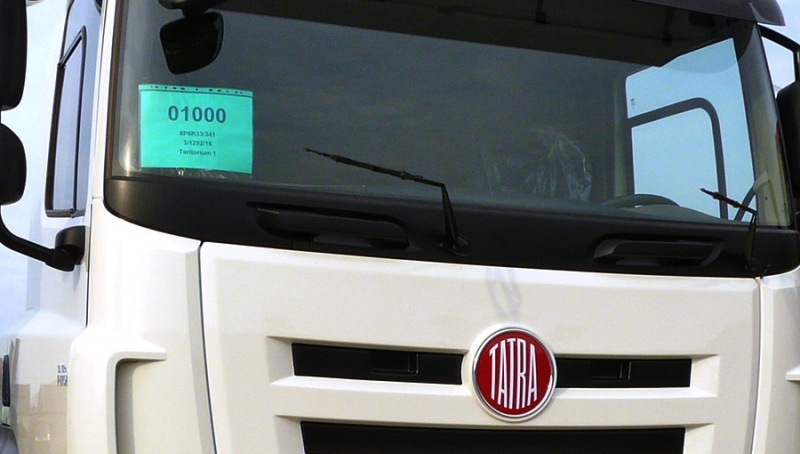 TATRA PHOENIX vehicles have enriched our truck maker’s portfolio in 2011. The combination of a structurally chiselled chassis, which embodies the Tatra design concept and has been perfectly honed over time, plus a DAF cab and assemblies purchased from abroad, have resulted in a significant enhancement of the customer-oriented strategy of Tatra production. The importance of the serial production of TATRA PHOENIX vehicles was globally underscored by the truck maker's presence in the candidate list of the prestigious International Truck of the Year 2012. Twenty-five of the most important European press periodicals in the segment of trucks, with a total number of copies of more than 600,000 magazines published monthly in twenty-five European countries, decided to grant the title of "Best All-Wheel-Drive Vehicle of 2012" to the Tatra Phoenix. So it happened for the first time in automotive history that a manufacturer from the countries of the former Eastern Bloc “made it” to the candidate list and the imaginary podium of the traditional, highly prestigious poll "Truck of the Year". A modernized range of the TATRA PHOENIX EURO 6 was introduced in 2014. It happened in connection with the new legislative measures in force related to emissions of harmful combustion products from heavy diesel trucks, collectively known and referred to as Euro VI. At that time the vehicles were well established in markets that were both traditional for the TATRA brand and completely new or else "recovered". The first deliveries of TATRA PHOENIX vehicles to western and northern countries of the old continent were important milestones. From the very beginning of the start-up of the TATRA PHOENIX range of vehicles, the truck maker has diversified their offer of heavy trucks into several selected segments corresponding to typical vehicle operation and use. Hence, TATRA PHOENIX has found satisfied customers in the segments of civil engineering, mining, forestry, agriculture, municipal services, as well as in fire-fighting equipment and special vehicles. In each segment, TATRA PHOENIX vehicles are equipped and fitted with such assemblies and components that allow them to optimally meet demanding customer requirements. After five years of serially producing the TATRA PHOENIX range, the TATRA brand has just produced and sold a PHOENIX vehicle with the serial number 1000. The jubilee vehicle was model TATRA 158-8P6R33/341 6x6 PHOENIX with Vehicle Identification Number (VIN): TNU8P6R336K001000. The three-axle vehicle with a wheelbase of 3340 mm (1320 mm) and 340 kW PACCAR MX-13 engine is fitted with a manually operated ZF 16S2570 gearbox, lightweight combined KING FRAME (11.5 t) suspension on the rear axles and, of course, air-suspended front axle. Once a three-sided tipper body is installed at the PARMA Servis authorized dealer, the vehicle will be delivered to the customer. We will bring you a report from that event. The vehicles of the TATRA PHOENIX series include models built on the I-type series chassis, exclusively featuring a pneumatic suspension of the front axle(s) and a new generation of steering systems. A typical feature is the unified design of various types of auxiliary (drop box) TATRA transmissions adapted to the installation of the main TATRA, Allison and ZF gearboxes, which are designed for manual, automated or fully automatic gear shifting. There are many model applications available, ranging from construction, special superstructure carriers, log trucks, agricultural tractors, vehicles for road maintenance and other municipal services to industrial machines and even integrated rescue system vehicles. The chassis come in 4x4, 6x6, 8x8 versions, including a version with one front and three rear axles, 10x8 or 10x10. A completely independent chapter includes those models homologated pursuant to current legislation as "agricultural tractors" using automatic Allison transmissions and a different number of steerable axles, including the rear VSE system.